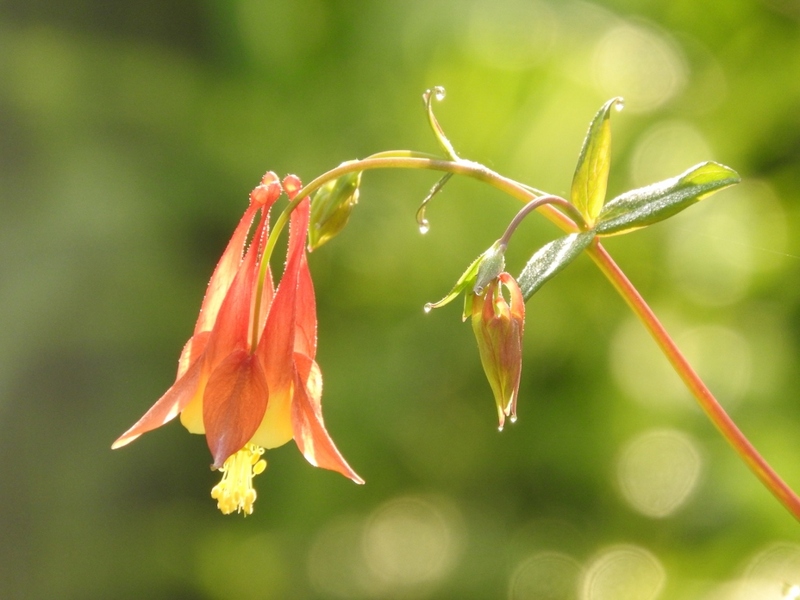 Many spring flowers contain both male and female parts on the same flower. They also use bright colors and sweet smells to lure in a certain set of pollinators. 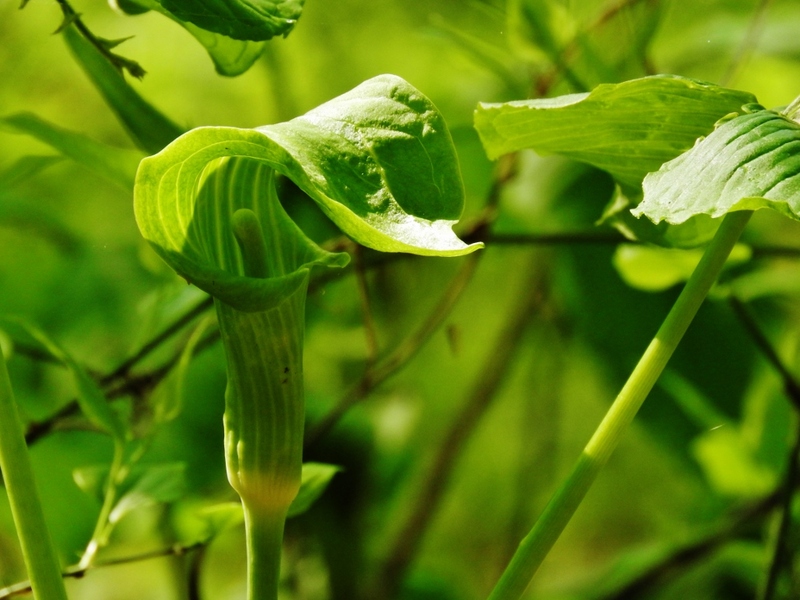 Jack-in-the-pulpit goes on a different route. time from having all male parts to all female parts. Bliss. 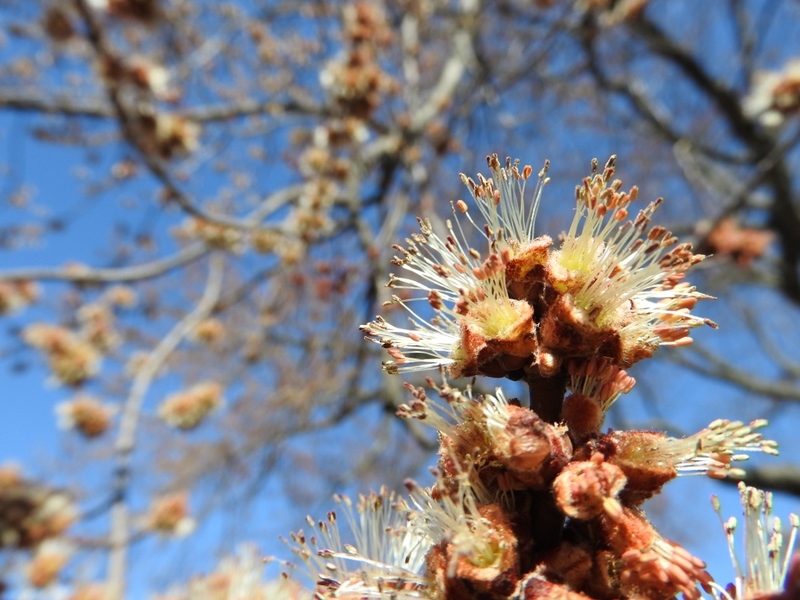 It was warm enough to wear shorts, but the mosquitoes hadn’t hatched yet, and the spring ephemerals were blooming. Days like that are rare in the Northwoods. So I kidnapped Mollie, the Cable Natural History Museum’s new curator, to show her Juniper Rock overlook on the North Country Trail. 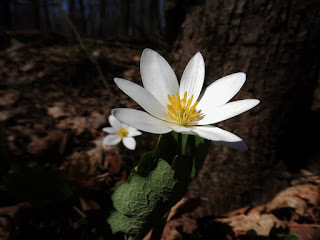 In the parking area, two shining clusters of bloodroot flowers spread their white petals to the sun. We took that as a good sign. After hiking past numerous small patches of bloodroot we came to a patch of rich woods. Wild leeks created an emerald carpet on one side of the trail, and a rock outcrop glittered with blossoms on the other. I scurried from one patch of flowers to the next with my camera, like following a trail of breadcrumbs. 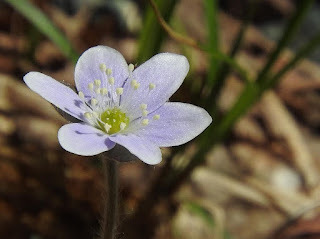 Hepatica! Spring beauty! Bloodroot! Oh my! Patches of bloodroot dotted the forest. While I found both the purple and the white color morphs of hepatica, all the spring beauties had bright pink pinstripes. 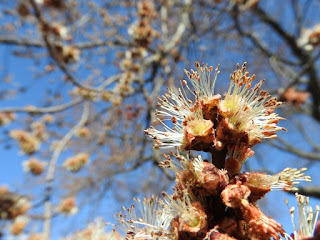 I’d just read a post about pure white spring beauty flowers on the “In Defense of Plants” blog, and was hoping to see one. Pigments are chemicals, and most pigments do more than just add color. 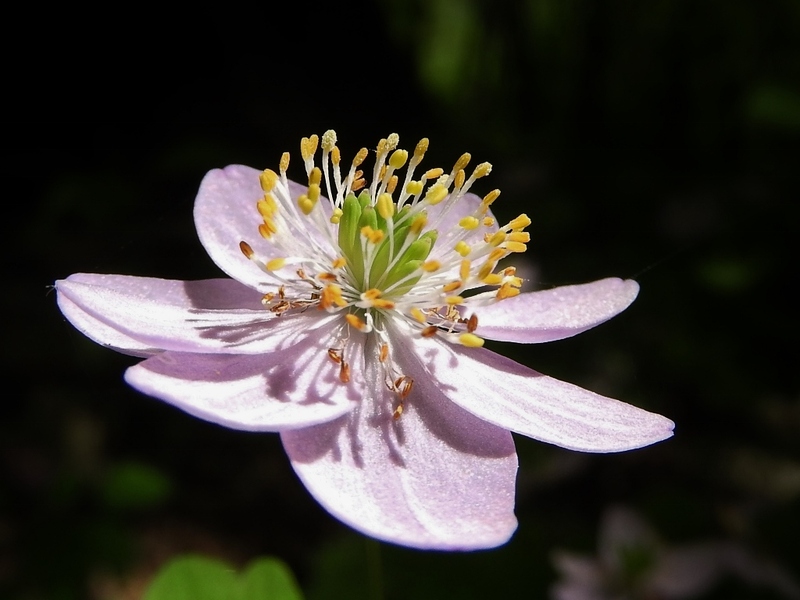 The white pigments in spring beauty flowers protect them from herbivory and pathogens. On the other hand, if spring beauties with the pink stripes can manage to avoid being eaten, they will attract more insects, which is necessary for cross-pollination and producing viable seeds. 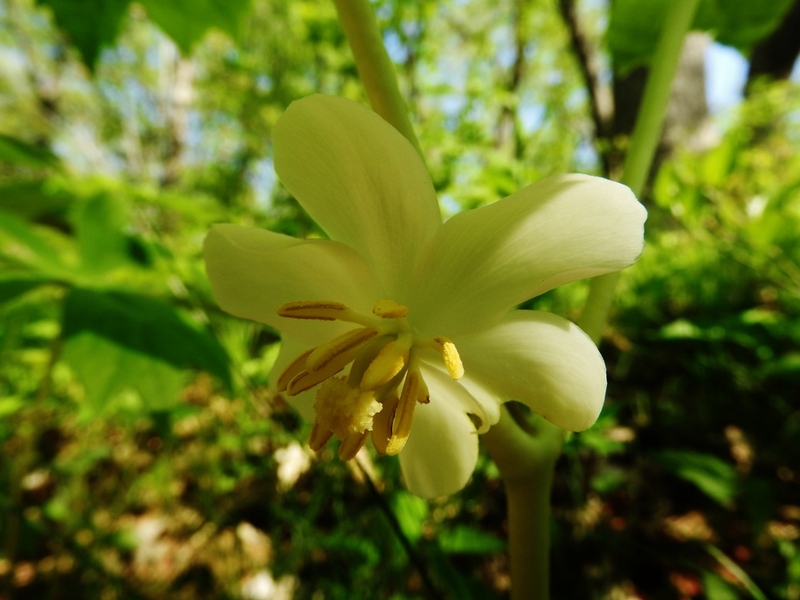 In areas where there are lots of white flowers of other species, the white spring beauties have even more trouble attracting pollinators and become even rarer than usual. With all the gleaming white bloodroot plants nearby, plus white hepaticas, the pink spring beauties had a monopoly on this patch. Hepatica blossoms can be white or lavender. I bent down to photograph one pin-striped blossom, and noticed a pale green spider clinging to the underside of the flower cup. 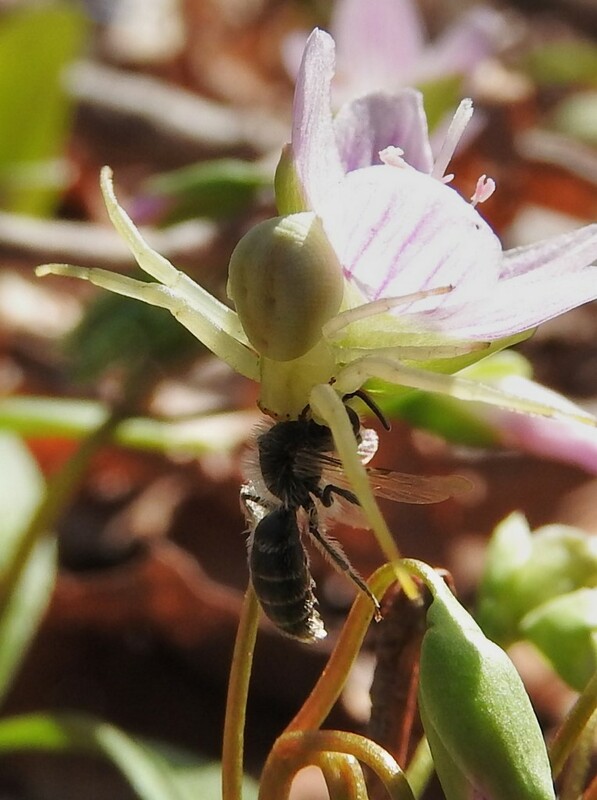 “A crab spider,” I exclaimed to Mollie, “it’s lying in wait for an early spring bee!” Then as I leaned in closer for a second photo, I laughed out loud. The spider already had a little bee clasped in its jaws. I love when Nature does what you predict. And equally, I love when it surprises you. This was a little of both. 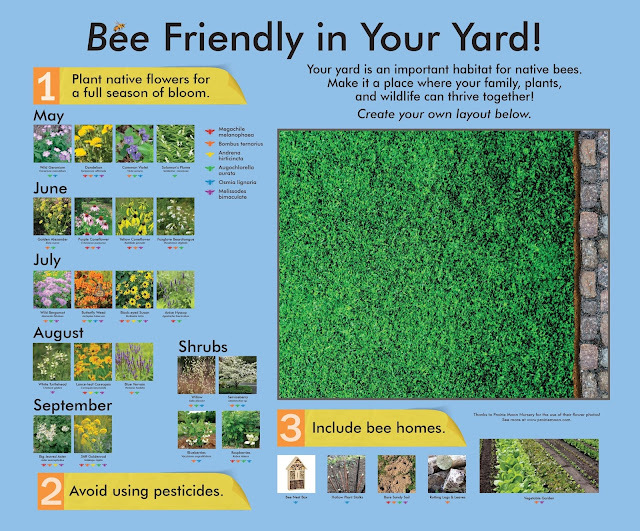 The bee sported a halo of short, white hairs around its thorax, along each skinny leg, and ringing each segment of its black abdomen. It must have been a female with all of those hairs ready to collect pollen to provision her larvae. 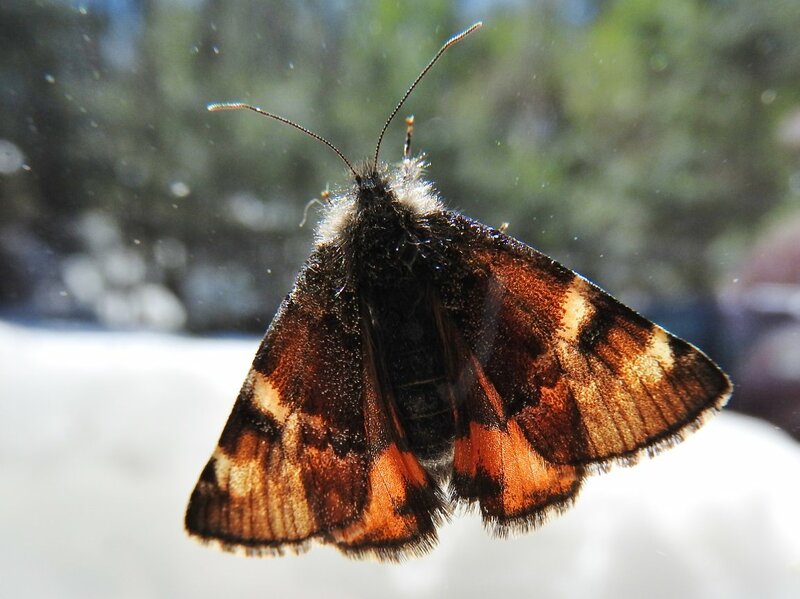 The fuzz can also hold in heat produced by its wing muscles and help these early season insects fly even on chilly days. Crab spiders wait on flowers to ambush pollinators. The crab spider was equally wonderful. As with bees, female crab spiders are bigger than the males. She can change colors to match her flower, too—from white to yellow to green—although the change takes several days. Crab spiders don’t build webs; they ambush unsuspecting pollinators with their crab-like front legs. Once prey is caught and subdued with venom, the spider holds its lunch with just her jaw while she slurps up the insect smoothie her enzymes have blended up. I left the woods in an even deeper state of bliss than I’d entered it. Not only was it a beautiful day, but I’d observed some exciting natural drama. The rest of my evening was spent getting ready for my summer sabbatical. As I packed natural history books about Alaska into a tub, I chuckled at how much my reading habits have changed since I was a kid. You couldn’t have bribed me to read nonfiction science books back then. I thought they were boring. I wanted stories with adventure, resourcefulness, mysteries, and magic. Laura Ingalls Wilder, The Boxcar Children, Anne of Green Gables, American Girls, The Bobbsey Twins, and Trixie Belden were my staples. I wrote fiction, too, either set in the pioneer days or magical kingdoms. I loved nature, and my heroines did too. 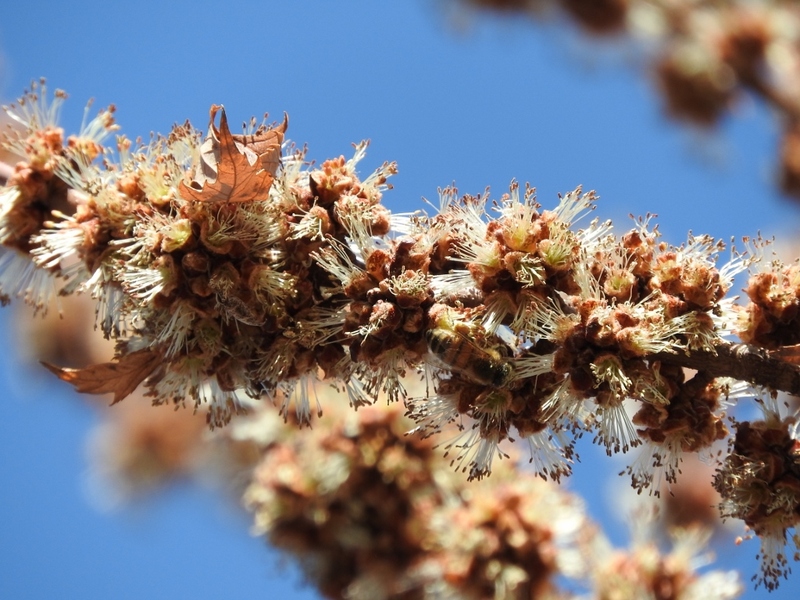 They used medicinal herbs to cure people or conjured up the powers of nature to defeat evil. But today I write only nonfiction and mostly read it, too. Somewhere along the way I realized that the stories in nature are as good as or better than anything we can invent. Spring beauty uses magic potions to defend itself and to attract suitors. Harried mothers are caught in the traps of a color-shifting villain (who turns out not to be evil). Don’t even get me started on the stories of parasites and symbiotic partners. 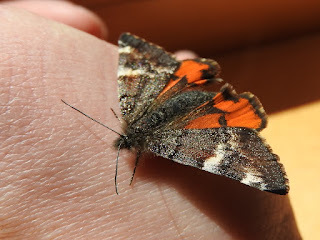 But none of those stories are apparent without careful observation, which is often carried out by dedicated naturalists, or by scientists conducting experiments. Adventure. . .resourcefulness. . .mysteries. . .magic. . .I still want to read and write about those themes; I’ve just discovered that I don’t need to invent anything. Nature has already done it for me. Scientists are busy translating, and I’m off to write those stories!